Home Breed Information Labrador Mix Breeds Lab Collie Mix – Is This Pup A Great Pet? Lab Collie Mix – Is This Pup A Great Pet? 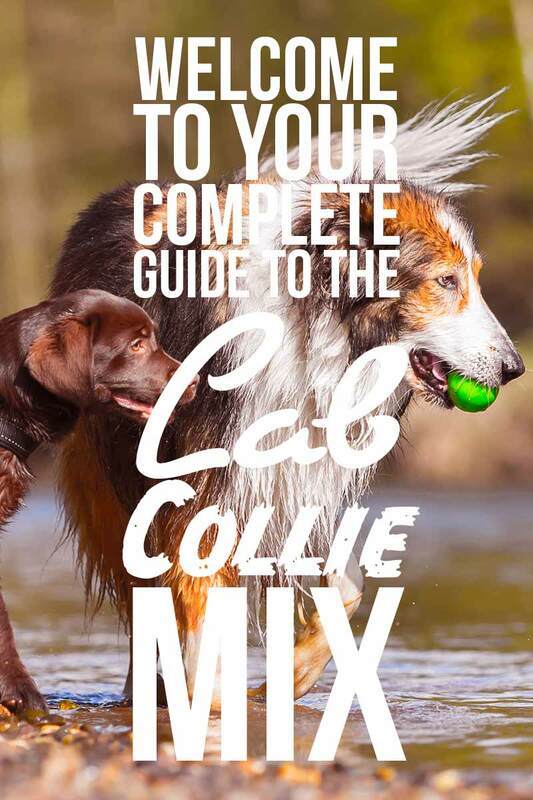 Welcome to our complete guide to the Lab Collie Mix. Just to clarify right off the bat, when we say Labrador and Collie mix, we’re referring to a Labrador Retriever mixed with the Rough-coated or Rough Collie breed, not the Border Collie breed. If you’re looking for info about the Border Collie Lab mix, please check out this article instead. I want to start with a brief discussion regarding the concerns about first generation mixes, as there tends to be a bit of controversy on this subject. After we tackle this touchy subject, then we can get into all the cool and interesting facts about this amazing, fun-loving mixed breed dog! It’s referring to the intentional crossing of two purebreds in order to ‘design’ a new breed. 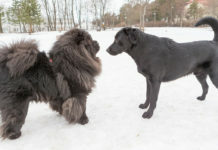 The controversy on the subject comes from differences of opinion over whether a purebred or a mixed breed is better. If you would like to read more on the subject, in order to make up your own mind, here are two articles that I believe fairly represent both sides of the argument: Purebred vs. Mutt, and Purebred vs. Mutt. Written by the same author, both articles provide lots of detail regarding the pros and cons of either camp. Is A Designer Dog Healthier? One of the most commonly cited arguments for mixed breeds is that they are supposedly healthier than purebreds. It’s actually impossible to prove that all of the hundreds of thousands of mixed breeds are healthier than the over 300 different pure breeds. On the other hand, it is possible to make some general statements about the comparison of the two. For instance, research has shown that purebreds have reduced vigor when compared to mixed breeds. ‘Reduced vigor’ simply means that purebreds tend to not live as long. They also have a lessened ability or likelihood to procreate. This does not necessarily mean they have more health issues. Research has also proven that inbreeding (which is how you get purebreds) reduces the size of the gene pool for the breed. A smaller pool means less chance of variation, which some people see as a positive trait. However, less variation means all genes, including unhealthy or damaged ones, are more likely to be passed down to puppies from their parents. In other words, once a disease or health problem gets into the genetics of the breed, it is more likely to be carried on and harder to try to get rid of it or ‘breed it out’. Despite these facts, please keep in mind that if you’re comparing any one purebred puppy with any one mixed breed puppy, either dog could end up being the healthier one. 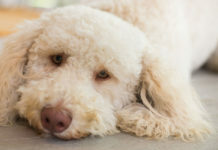 Your dog’s health should be your top concern, no matter if it is a purebred, a designer dog, or a fourth-generation mutt that you’re considering. Now that we’ve covered what a designer dog is, let’s discuss how this specific designer dog came about. Interestingly, this particular designer dog is not yet registered in the International Designer Canine Registry. This means that information is pretty limited on when and why the Rough Collie Lab mix originated. To provide a little more background into this interesting mix, we will look at the origins of each parent breed. The Labrador, contrary to its name, actually originates from Newfoundland, Canada (not Labrador). This hardy dog is a descendant of the St John’s water dog, which was the dog of Newfoundland fishermen. It worked alongside the fishermen, in the water as often as on land, helping haul nets and lines, and retrieving fish. The hunting and sporting community in the UK began to fall in love with these Labradors in the late 1800s and early 1900s thanks to their tireless energy, wonderful temperament and ability to work. The Kennel Club in England recognized the Labrador Retriever in 1903. The American Kennel Club followed suit 14 years later, in 1917. The Labrador is the most popular pet dog in the US and the UK today, and is the most popular working retriever in the world. To read more about the amazing history of this beautiful breed, please check out this article: Where Do Labradors Come From – History and Origins of The Breed. The Rough Collie is believed to have originated in the Highlands of Scotland in the 18th century, where it was bred as a sheepdog for herding and guarding the flock. It became a show dog in England in the 1860s, and the first English Collie was brought to the US in 1879. The Collie Club of America was founded in 1886, making it one of the oldest specialty clubs in American existence. There are two different varieties of Collie – the Rough and the Smooth. They are identical except for their coat. What’s A Good Collie Lab Mix Description? 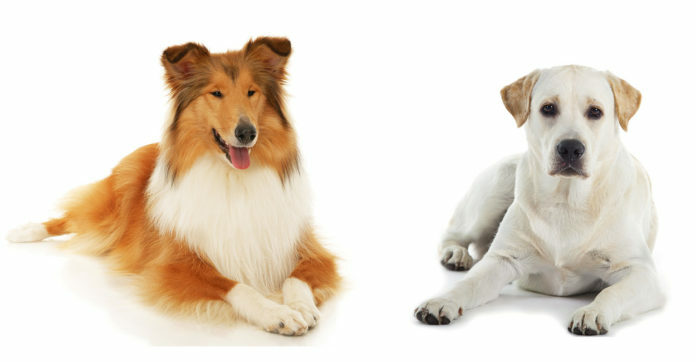 A Collie Lab Cross could end up with the physical description of either parent breed, or a combination of the two. If you’re familiar with the famous Lassie from movies or television, then you know what a Rough Collie looks like. The Rough Collie has a long rough coat everywhere except the head and the legs. This Collie comes in four different colors. Sable is the most popular, as it’s Lassie’s coat. Regardless of which color coat your Collie has, it will likely have a white collar, chest, legs, feet, tail tip, and sometimes a blaze, or white markings, on its face. The Collie is considered a medium to large size dog, typically ranging 50 – 65 pounds for a female and 60 – 75 pounds for a male. Average height is 22-24 inches for the female and 24-26 inches for the male. The life expectancy of a Collie tends to be 12-14 years. Labradors come in three solid colors: brown, black and yellow. Labradors are also considered a medium to large dog. Male Labradors tend to range in size from 65 to 80 pounds, and 22.5 to 24.5 inches tall. Females range from 55 to 70 pounds and 21.5 to 23.5 inches tall. Labradors have an undercoat, and a short, dense, water resistant top coat sometimes called a Guard coat. These dogs also have a distinctive “otter” tail. The average life expectancy for a Lab is 10 to 12 years. 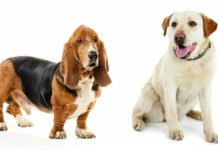 While similar in size, the face shape, coat type and coloring of these two parent breeds are very different. There are many possible physical combinations that a Labrador Collie cross could end up with due to this. The temperament of an individual puppy can never be guaranteed, which is why proper socialization and training is always very important. However, we can look at the general temperament of both parent breeds to get a better idea of which characteristics Labrador cross Collie puppies are most likely to exhibit. Labradors are an incredibly popular dog, and one of the reasons for this is their remarkable temperament. Labs tend to have very friendly, outgoing, and playful natures. 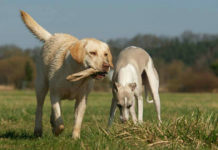 They are high energy, very active dogs that typically get along with others, whether human or animal. As sporting dogs, Labs are known for their instincts in woods and water and tend to love to swim. Labrador Retrievers have a reputation for being tireless and incredibly social, with stable, even temperaments. Lassie embodied the ideal temperament of a rough Collie: a dog who is proud, graceful, and completely devoted to its human family. These dogs are moderately active and incredibly intelligent. Collies have long been considered ‘family dogs’ that tend to be very good with children and require lots of human interaction and contact. Collies have a tendency to be vocal and bark, but are not generally aggressive dogs. However, a recent research study in Sweden did find that Rough Collies commonly had fear-related problems, which they believe to be genetic. With a healthy puppy from a good home, proper socialization and training, this interesting mix is likely to result in a very social, loving, active dog with a stable temperament. Both the Labrador and the Collie shed seasonally. Collies should be brushed once every week or two when they have their full rough coat; it can be a bit less in the summer. Labradors do not need bathing or grooming as often as some other breeds due to their low-maintenance, coarse coat. Labrador Collie puppies could end up with the coat and care requirements of either breed. Two common health conditions in Labrador Retrievers are hip dysplasia and elbow dysplasia. What this means is that the joint and ball socket are not properly formed. As a result, they may rub and grind together, causing pain and wearing down the bone. Ultimately this can lead to a loss of mobility. It’s important to be aware of this potential issue in order to catch it early. Studies have shown that treatment done before your dog reaches 2 years old tends to be more successful. When buying a Lab or Lab mix, please ensure that both parents have good hip and elbow scores. This will lower the chance of your puppy having dysplasia. Unfortunately, a significant factor relating to hip dysplasia is body weight, and Labradors also commonly face weight issues. A 2015 study found that Labrador Retrievers are more food obsessed than other breeds. However, one year later, a different study suggested Labrador obesity may actually be linked to a genetic trait rather than just food obsession. Regardless of the cause, Labradors have an increased likelihood of obesity. This, combined with their increased likelihood of hip dysplasia, can result in serious medical complications if your puppy is unfortunate enough to inherit both traits. Obesity is also commonly associated with a shorter life span, mobility issues, diabetes, heart disease, and cancer. While generally considered a healthy, sturdy breed, Collies are known to have certain health issues more often than others. One common health concern for Collies is Collie Eye Anomaly. This is an inherited eye problem that will be present at birth. However, it is not necessarily something an average vet can diagnose in a young puppy. Therefore, the Collie Club of America recommends having any Collie puppy of 5-6 weeks old checked by a qualified Board Certified Ophthalmologist. In addition to an eye test, the Orthopedic Foundation for Animals (OFA) recommends a Multiple Drug Sensitivity test. Collies have shown some sensitivity to certain drugs, including Ivermectin, which is a common drug for heartworm control. It is recommended that unless you have had this testing completed and you know your dog is safe, never give your Lab Collie mix any heartworm medication or heartworm preventative that contains active Ivermectin. If you have any concerns about this, or any other potential health issues with Lab Collie cross puppies, please consult your veterinarian. As Lab Collie mix puppies could inherit the health issues of either parent breed, it is important to have them tested for both. When considering a Lab Collie mix puppy, make sure you inquire into its parents’ health as well, particularly the hip and elbow scores. Also ensure your puppy has had an eye exam completed by a qualified registered professional. Labradors are high energy dogs built for endurance. Collies are medium energy but still fairly active dogs that will enjoy and benefit from long walks. Labradors are in the Sport Group of dogs and tend to excel at running, hunting, fetching, and swimming. Collies tend to excel at agility and herding; often enjoying and excelling at obedience and obstacle training courses that incorporate these skills. 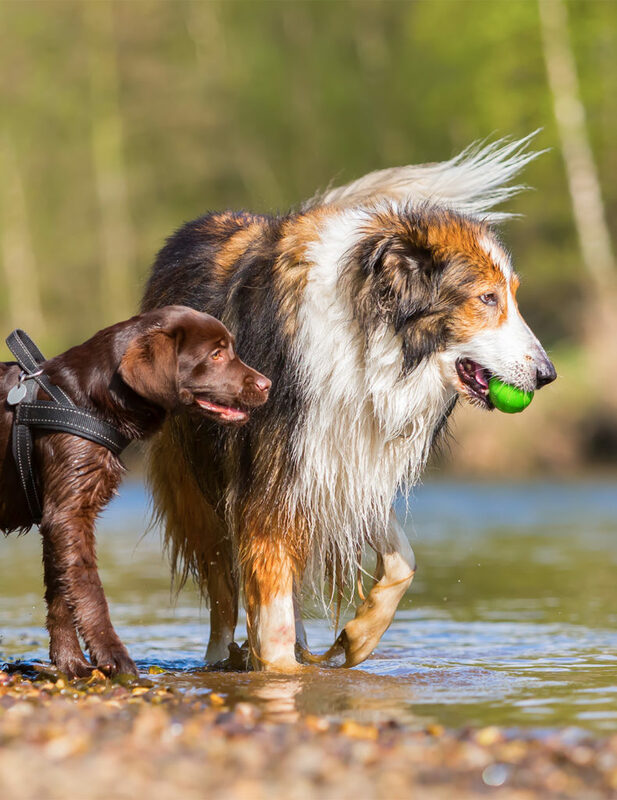 This means that regardless of whether you have a Black Lab Collie mix, a Chocolate Lab Collie mix, or a Yellow Lab Collie mix, your puppy is likely to need a fair amount of daily exercise. If this exercise includes mental stimulation such as teaching tricks, even better! Proper training is important to ensure your pet is a well-adjusted and well-mannered companion. 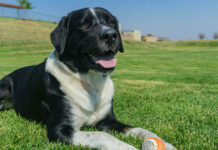 Thankfully, a Labrador Collie mix will likely be intelligent and eager-to-please, which should make training relatively easy, compared to more stubborn breeds. Both Labradors and Collies are generally loving, social animals that do well in homes with small children and other pets. Labradors and Collies will enjoy prolonged periods of exercise outside, but not alone. If Collies are kept outside for extended periods of time without human contact they will become bored and lonely, which could result in behavioral problems. In other words, Lab Collie puppies will do best in a home with a family that will take them out to suitable natural environments regularly for exercise and will be home often to provide social contact. Since Collie x Lab Puppies are not purebred and are not on the International Designer Canine Registry, it may be challenging to find breeders. When searching for Collie Lab puppies, make sure you’re getting the breed mix you’re expecting, and not a Border Collie Lab puppy. 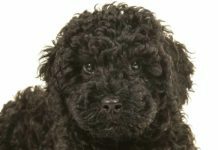 If you’re considering getting a puppy from someone other than a registered breeder, it is also very important to ensure your puppy is coming from a reputable source. Pay attention to the type of living conditions the puppy is in. Ask about both parents and get as much information as you can to understand the background of your puppy. This will help predict any potential issues or areas for concern. Remember that it’s unfortunately impossible to guarantee your puppy’s temperament. Again, this is why proper socialization and training are so important. Also remember that you could end up with any aspect of either dog breed. Your puppy could also end up having a medical condition not seen in either parent. This is why health testing is very important, particularly for issues that are known to impact both parent breeds, such as hip and elbow dysplasia and eye problems. Arvelius, P., Eken Asp, H., Fikse, W. F., Strandberg, E., Nilsson, K., Genetic analysis of a temperament test as a tool to select against everyday life fearfulness in Rough Collie. Journal of Animal Science, 2014. Burgess, K., Moore, A., Rand, W., Cotter, SM. Treatment of immune-mediated hemolytic anemia in dogs with cyclophosphamide. Journal of Veterinary Internal Medicine, 2000. Previous articleIs Your Dog Home Alone: How Long Can You Leave Your Lab?